We all love our smoothies, but do you know which ingredients make the best smoothies? Choose the wrong ingredients and your lovingly prepared thirst quencher can quickly turn into a sugar-laden bomb. We give you the low down on the best smoothie ingredients. What are the best fruits and vegetables? How do you choose the healthiest liquid base? What about sweeteners and other extras? All these and other questions will all be answered. All smoothies need a liquid base. Without liquid your blender simply wouldn’t work properly. It helps the blender blades do their job by moving the fruit around making it easier to chop. 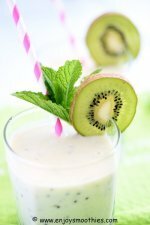 So what are the best liquid options for smoothies? Plain old water is hard to beat. It has no calories and no additives and when it comes from the tap costs nothing. Which is best, tap or bottled water? This really depends on where you live. Generally public water supplies are very safe (particularly in western countries). If you have any doubt you can use bottled water. But be aware that bottled water supplies aren’t always regulated. In fact some bottled water comes straight from the tap and is not the pristine mountain water we imagine. The safest and most cost effective option is to use filtered tap water. A filter will remove chemicals and any strong smell. An under the sink water filter system will remove or greatly reduce chlorine, cancer causing organic/chlorine compounds, toxic heavy metals and bad odors. 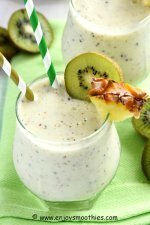 Fruit juices such as orange, pineapple, apple and pomegranate give smoothies a sweeter taste. However, beware the juice trap. While there’s no doubt fruit juice is healthy, full of vitamins minerals, enzymes and antioxidants, it also packs a lot of sugar and calories. Juice is concentrated fruit and it’s very easy to consume too much. If you have made a breakfast smoothie using fruit juice, then I wouldn’t recommend consuming any more that day. Drink water instead. When buying fruit juice remember to read the labels. Avoid anything that is labelled juice cocktail, juice-flavored beverage or juice drink. These contain little, if any, real juice and are no better than soft drinks. Look for juice that is labelled 100% fruit juice with no added sugar. Better yet, juice your own. That way you can be sure there is no added sugar or other additives. Which are the best choices? Pomegranate juice has the biggest nutritional payoff. It is high in antioxidants, more in fact that green tea. Cranberry juice is also another good choice. It is packed with vitamin C and powerful flavonoids called proanthocyanidins. Drinking cranberry juice helps prevent the build-up of bacteria that cause urinary tract infections. Acai berry juice also has high concentrations of antioxidants, more than blueberries. 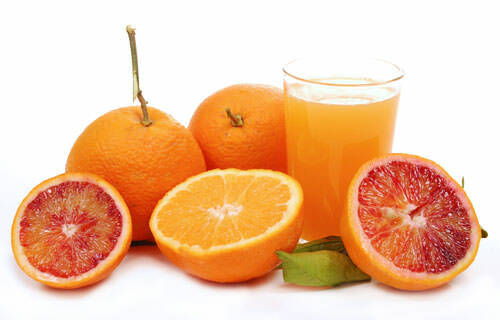 Orange juice is loaded with vitamin C and contains fewer calories than some berry juices. Milk is an important source of important nutrients, such as calcium, B vitamins, protein, minerals and vitamin D and makes smoothies creamier. But many people simply can’t digest milk because of the lactose. For them drinking a glass of milk results in nausea, bloating, cramps and diarrhea. Added to that an eight ounce glass of whole milk contains almost 5 grams of saturated fat, or about 20% of the recommended daily limit. One alternative is to use skim milk, another is to use another type of milk. Fortunately there are a wide variety of non-dairy alternatives such as soy milk, rice milk, fruit milks and nut milks. These are equally good sources of protein and calcium and may be substituted for dairy products in smoothies. You may not have considered tea as a smoothie ingredient, but green tea makes a very healthy smoothie base and you won’t notice its taste. Green and black tea leaves come from a shrub or small tree indigenous to the forests of Asia. What is the difference between green and black tea? Green tea is less processed and not fermented like black tea. This enables the tea leaves to retain their green color and distinctive flavour. Green tea is considered one of the world’s healthiest drinks. Because it undergoes less processing than other tea it contains more antioxidants. 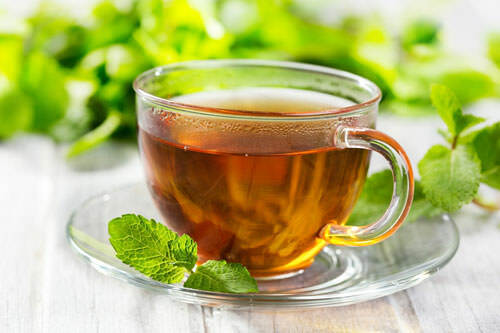 The natural chemicals contained in tea, called polyphenols provide its anti-inflammatory and anti-carcinogenic effects. There are several ways to use green tea in smoothies. The leaves can be crushed to a fine powder then added to your smoothie. Use one teaspoon for each cup of smoothie. Add to other ingredients before blending. But the best way to use green tea is to make an infusion. Place 1 teaspoon of dried green leaves into a teapot and pour over ¼ cup of boiling water. Cover and leave to steep for 2 minutes, then allow to cool before adding it to your smoothie. To save time, make a large batch of tea and keep it in your refrigerator in a sealed container for ease of use. 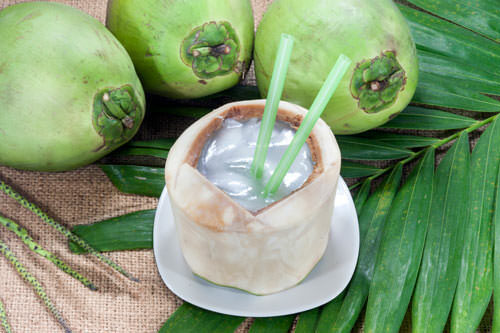 Coconut water is the clear liquid found inside a young coconut. Naturally refreshing, with a sweet, nutty taste, it is often used as a sports drinks as it hydrates the body by replenishing electrolytes. 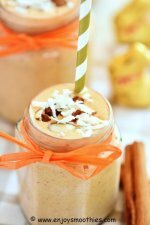 Coconut water is a great choice if you want to make healthy smoothies. A natural beverage with no artificial additives or sweeteners, is fat free and low in carbohydrates. 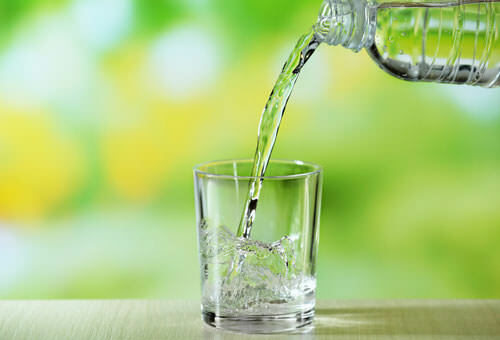 It is not entirely calorie-free, but its 50 calories per serving still make it a low-calorie drink and a healthy alternative to those sugar laden sodas and fruit juices. However, unless you live in an area where young coconuts are available fresh, you will have to buy pre-packaged coconut water. When buying coconuts, look for ones that are young and green. Once they develop a hard brown shell, the coconut has matured.